«©NCSX» The Kubrick 400% versions of Han Solo and Luke Skywalker in Storm Trooper outfits were released 5 years ago and they sold like gangbusters. The Darth Vader 400% sold well but too many of those were produced and they saturated the market. 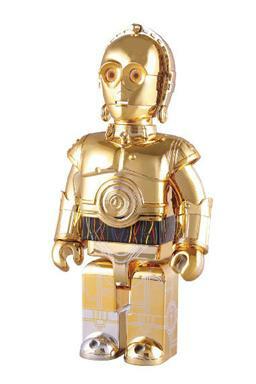 For the next Kubrick 400% Star Wars figure, Medicom turns their attention to the golden one. No, not Donald Trump but the wise and slightly batty C-3PO who has seen more action than most language bots should have a right to see. C-3PO measures 30cm or 11.81" tall and sparkles like a spit-shined hubcap. Medicom is limiting the production to only 1000 units. Whereas the Batman is straight-laced and numbingly sober, the Joker is loosey-goosey. If he were candy, he'd be two packs of Twizzler. The members of the rock band Kiss are given the Kubrick treatment in Medicom's upcoming figure collection. 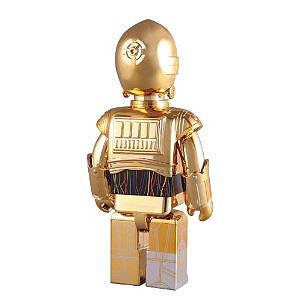 Medicom has started preorders for Lost Kubrick figures which measure 6cm or 2.36" tall and feature a core cast of characters. Shrek, Baron Farquaad and the Gingerbread Man make up the first set of Shrek Kubricks from Medicom. Donkey, Princess Fiona and a Farquaad imposter dubbed "Mascot Boy" show up in the second set of Shrek Kubricks. Knight Shrek and his Princess Bride Fiona are packed in the third Shrek Kubrick set.